High thurls and really nice topline in spite of being ready to spring into action! This lad has the level topline and width we treasure. A little stockier than his Bro. She is the spittin' image of her mum. Keebler is such a nice buck we repeated this breeding and love the results! Rose Petal and Mac are another great match for width and a 'leg at each corner. TopTen milkers on pedigree top and bottom. She was posing nicely, unlike her sister. ​Sometimes posing is just not going to happen. Structure and his genetics have lots of milk! Giggles lives up to her name! She is a sweet character. She also lives up to her genetic potential in the milk pail! 2017 NWODGA (Have to get some current pictures! Chamisa is an outstanding Milker! Last year she did 825# with 58# BF. 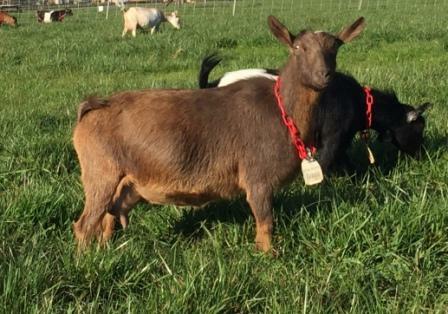 Yvette is the original pocket goat. She knows everything that is in your pockets. Steady milker, very helpful too. #23 is a cute little wether to be dressed in black and white. Photo ops were not on his dance card the day of school pictures. Maybe later he will join us. DOE #25 Missed the family picture session. She will try again soon! ONLY 40 more babies to GO! WOOHOO! SEE PAGE TWO FOR MORE!